This Post has already been read 2420 times. 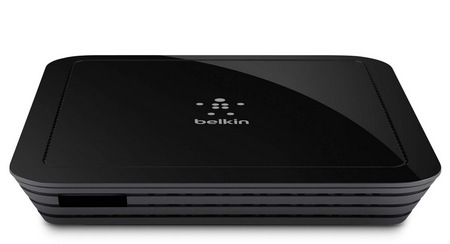 Belkin launches its @TV Plus, a box designed to bring live and recorded TV content to mobile devices. The device can connect and control multiple sources, such as a digital cable box, satellite receiver, or DVD player, and works with both standard and HD programming and provides full HD output. With the @TV plus, you can watch your favorite TV shows, movies and other TV content, either Live or recorded, anywhere anytime using your tablet, smartphone, or laptop with WiFi, 3G, or 4G access. The @TV Plus has Ethernet LAN port and built-in WiFi. It can even record directly on mobile devices. The streaming box offers an easy to use Channels Guide with swipe surf for easy scrolling. It works with the @TV app on iOS and Android and is compatiable with Windows PC and Max. Belkin’s @TV Plus (GIV1000) is priced at $149.99.